Manufactured in France from 1957 until 0. For the first time (but not the last, I hope), I will not speak myself about a camera of my collection. Admittedly, It forms part well of it, but it is Danny who will speak to us about this camera that it used. This camera uses the negative ones of format 120 in 6x6. The shutter is a model with sector at a speed (± 1/45ème of second) and an exposure. Moreover, a yellow filter makes it possible with a film color to soften the lights too sharp and gives an aspect “to lay down sun” with the photograph. Two apertures are available one with a symbol “sun” which according to my calculations must be of F 1:8 and another F 1:12.The lens is traditional meniscus, if it is not that it is possible to regulate the focusing distance in a way more precise than on Isoly or Clack. It is enough to make turn the lens according to three positions (see photo). This type of Focusing makes it possible to carry out clear photographs like approaching up to 1,5 Mr.The base for a Flash as well as the catch on the right side of the lens allows the use of a flash. However, on my model, synchronization with an electronic flash is not perfect, whereas on my Isoly which has an almost identical device of release, I frequently use the flash without problem. The body is a mixture of plastic and metal, which enables him to be solid without being too heavy. 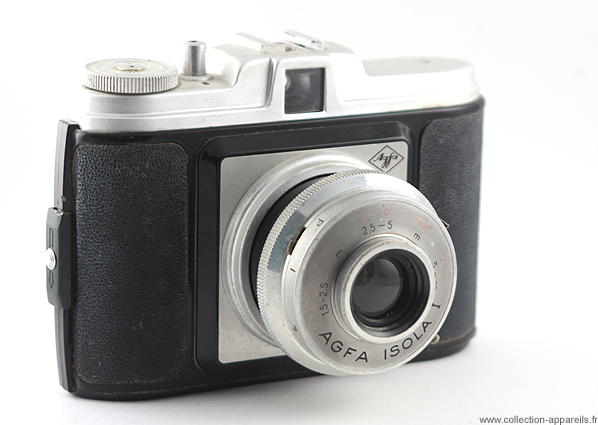 According to certain Web sites, this camera was built between 1956 and the Sixties (*** to see footnote). However, the data diverge from a site to another. My specimen goes back to 1961 according to its former owner, considering it was a gift of communion, and as this person was 52 years old and than the communion takes place around the 12 years, calculation remains simple. ***: These differences in dates are explained by the fact why this camera was manufactured in Germany and France, but not completely simultaneously. He was manufactured 1957 to 1963.